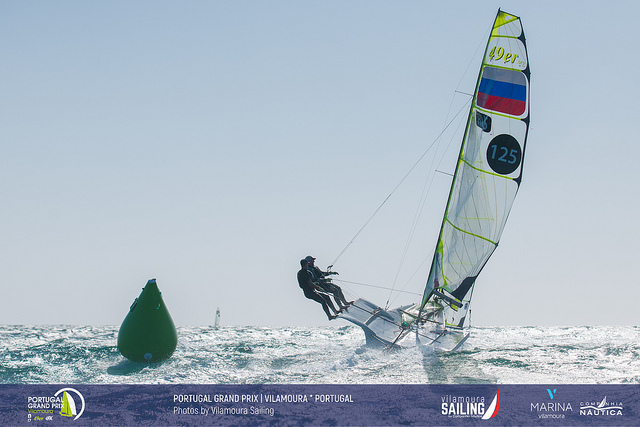 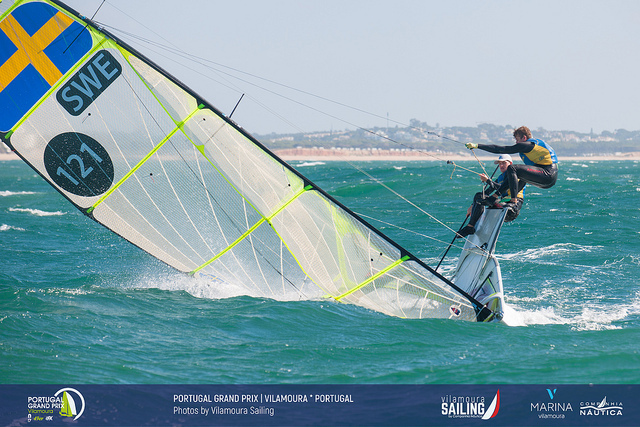 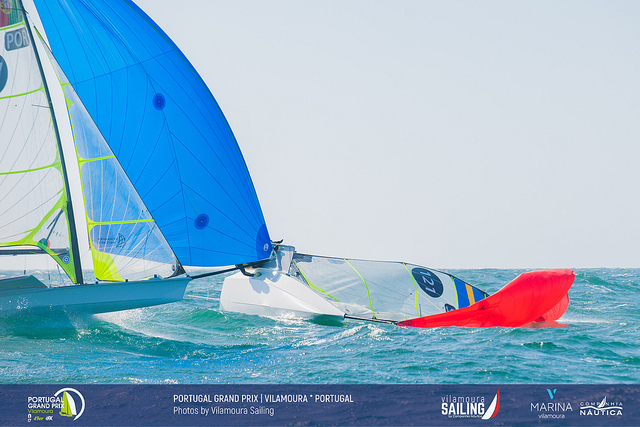 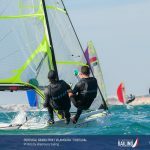 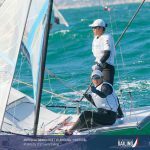 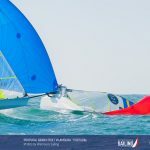 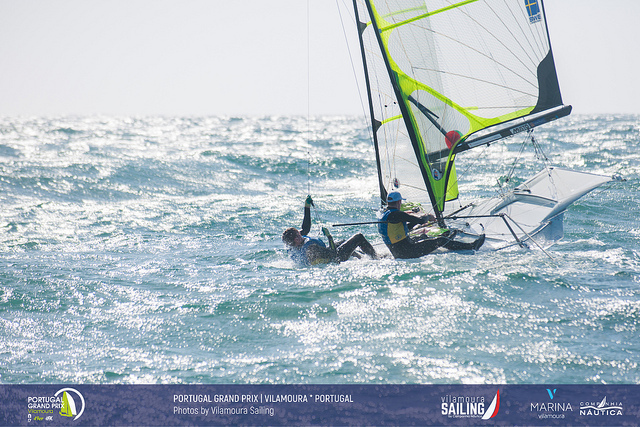 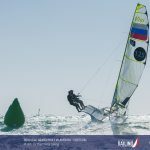 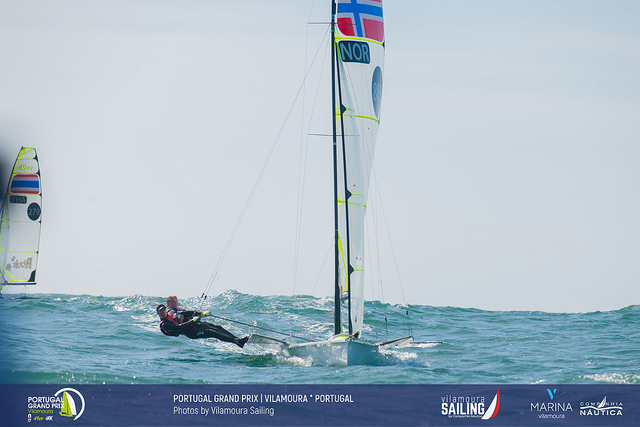 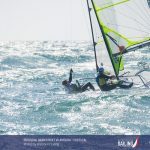 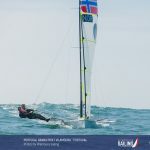 Martine Grael and Kahena Kunze (BRA) sailed a 3, 7, 3 in light and tricky conditions of the final day of the mid winters regatta to claim the win in the 49erFX. 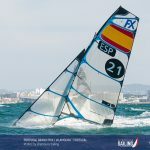 On the 49er side, it was never in doubt with Diego Botin and Iago Marra (ESP) dominating from the first day to win comfortably. 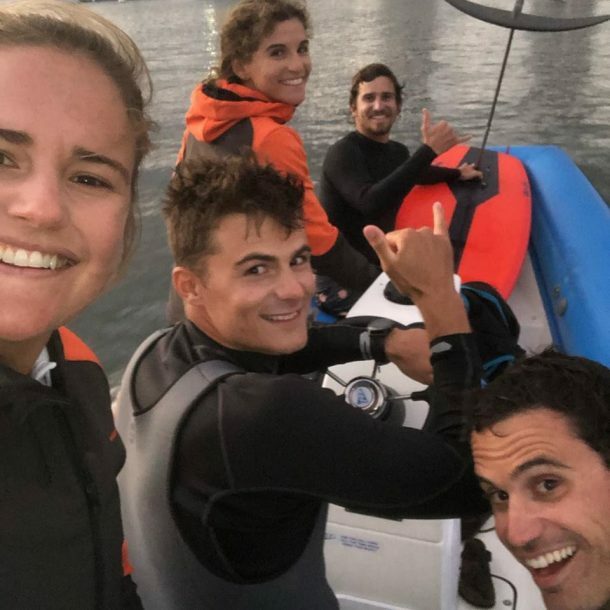 These two teams are also good friends off the water, so it was a happy weekend celebrated by post racing wake foiling! 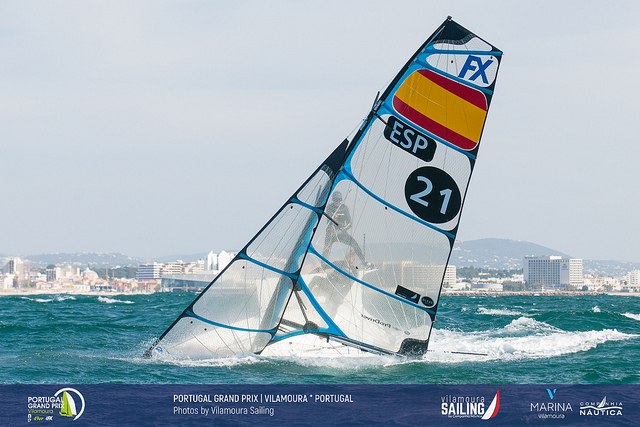 The Spaniards had complete control of the regatta despite a 37 boat fleet that had almost all of the global contenders in attendance. 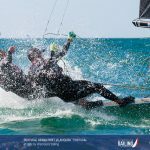 In a deep fleet it’s rare to win a 3-day regatta by so much, but with everyone in practice mode it’s slightly different than a proper championship. 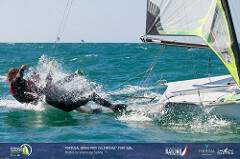 Winds were light on days 1 and 3, and quite heavy enough on day 2 so that only 2 races were held. 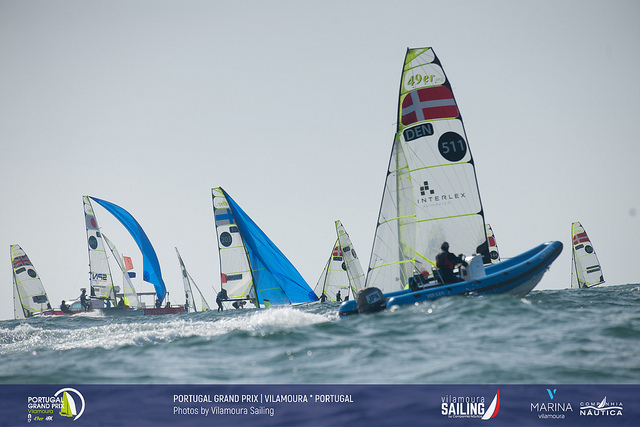 Day 2 was survival conditions for both fleets. 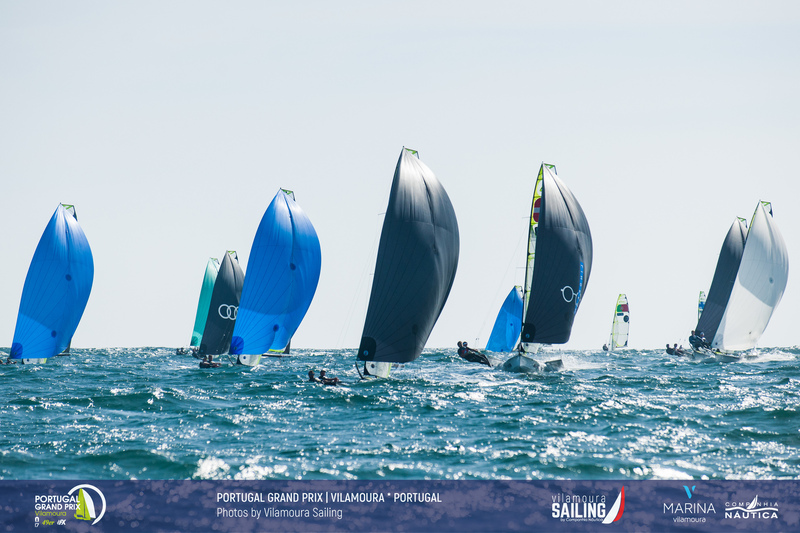 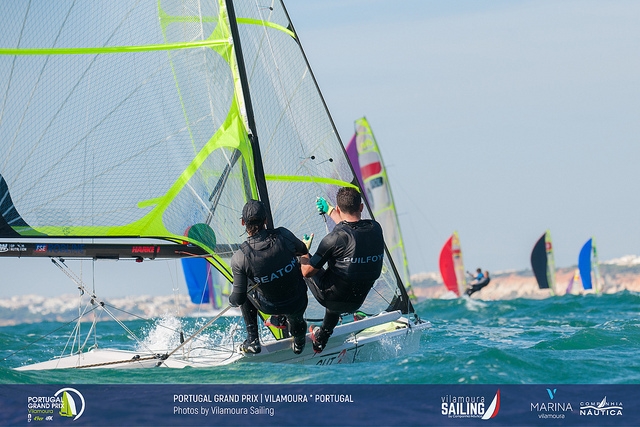 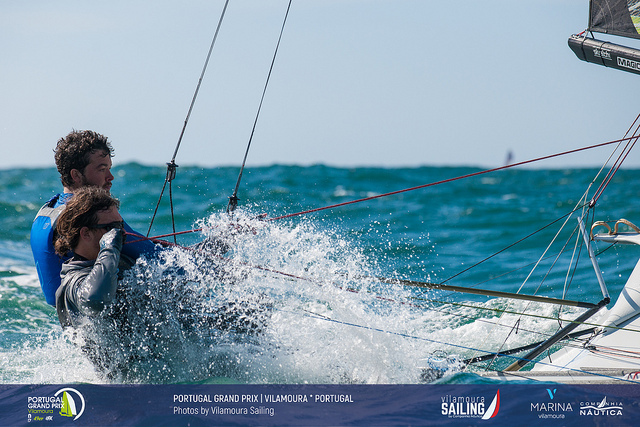 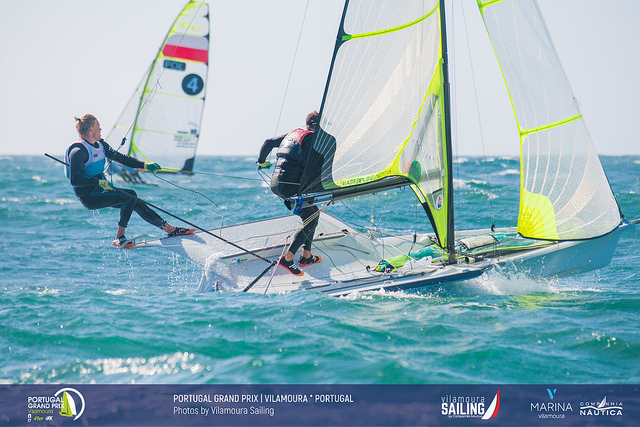 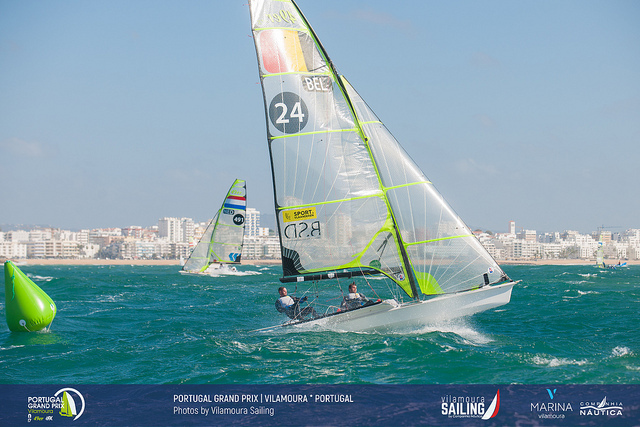 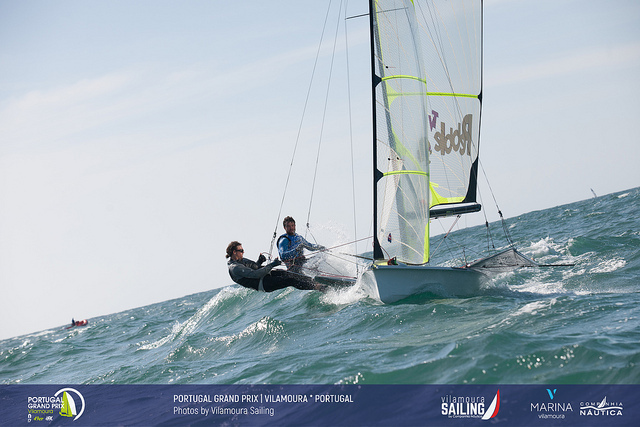 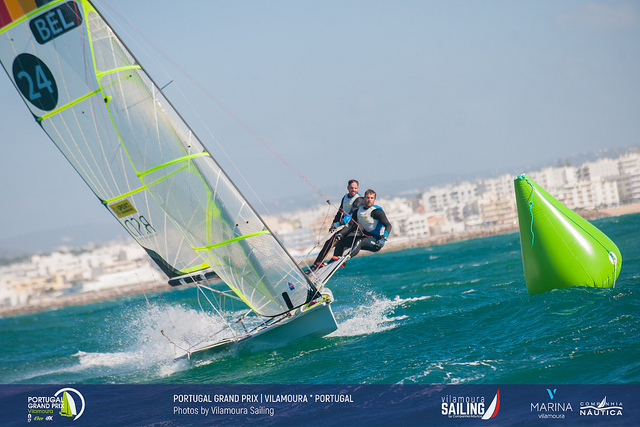 Most teams have been spending the winter in Vilamoura, on the southern end of Europe, but capsizing into warm waters was a welcome change. 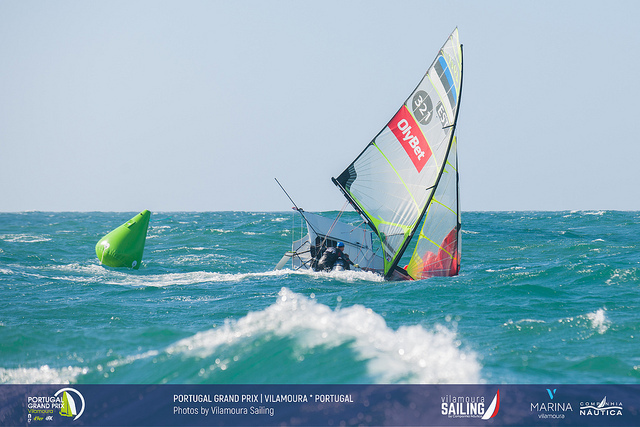 Botin and Marra’s worst race was a 9th but that included a capsize right before the finish line, which can give an idea of the amount of breeze these teams were dealing with. 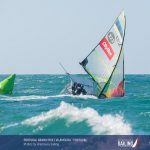 It was so windy that late arrivals to Miami, Erik Heil and Thomas Ploessel decided to only do the upwinds. 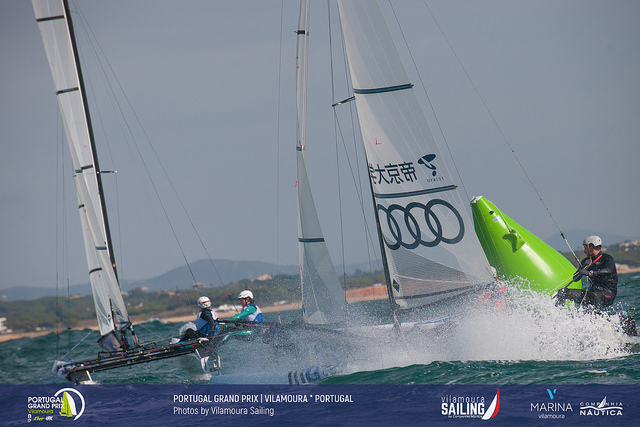 They were 3rd to the first mark in race 1 and then lead to the top mark in race 2 before heading straight home. 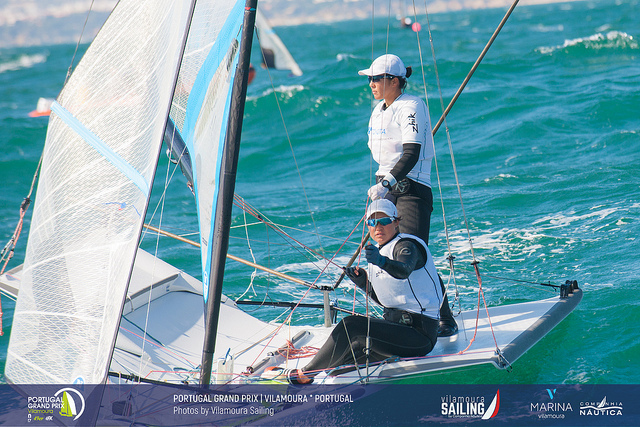 The Bronze medalists from Rio haven’t trained or sailed since the 2018 Worlds as they are both finishing their studies. 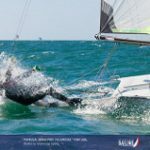 Training regattas can sometimes lead to different choices on the race course, and these two decided prudence was their best course of action. 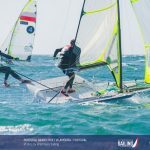 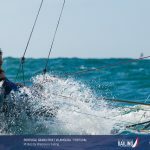 Austrians Bildstein – Hussl won two races on the final day to grab second spot overall, while #Don’tCallMeYoungGun’s Meggendorfer – Spranger (GER) sailed a consistent series to grab third overall. 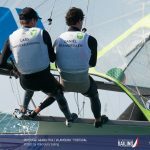 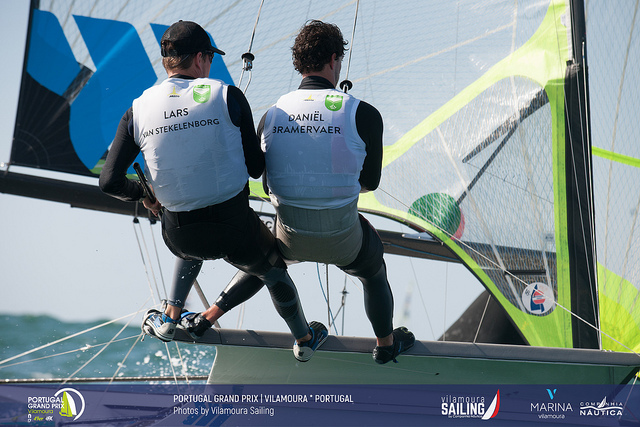 Fourth overall was a new pairing, as David Gilmour has teamed up with his younger brother Lachy to be the newest sibling team in the 49er Fleet. 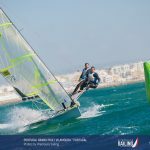 Gilmour and Turner finished 3rd at the 2017 World Championship, but never really got on track in the 2018 seasons so have now each teamed up with new crews and are tackling the 2019 season as foes. 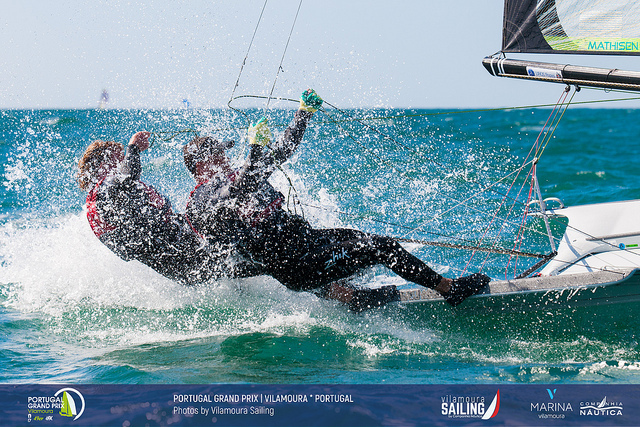 The 49erFX was a tighter battle for the win, with the lead changing places on each night. 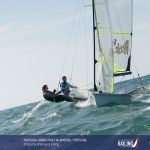 At regattas end, it was Grael & Kunze who finished without a result out of the top 10 except for the opening race OCS. 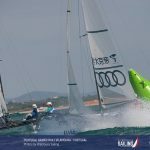 Their 10 point win exaggerated their lead as both 3rd and 4th place finished with double digit finishes they could not drop. 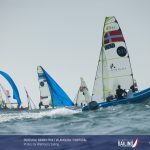 American’s Stephanie Roble and Maggie Shea were in contention for the win all weekend, but a 14, 12 start to the third day pushed them out of touch of the ultimate win and into second place. They finished the regatta with a bullet, to go along with 5 other races out of 8 in the top 10. 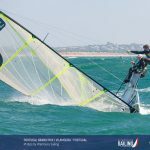 The American 49erFX fleet has plenty of competition, and this duo, coached by 2015 World Champion Giulia Conti, is steadily improving. 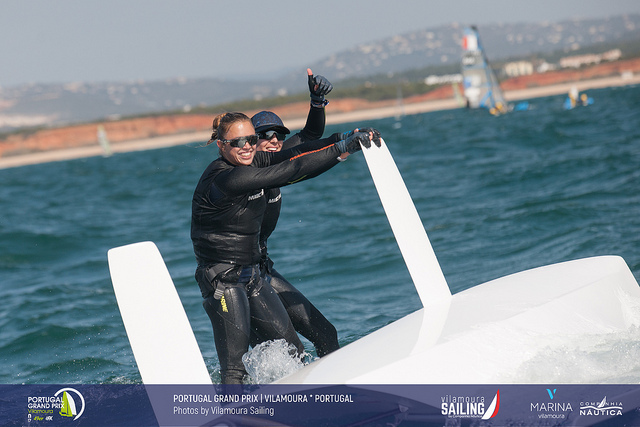 The final place on the podium went to Odile Van Aaholt and Marieke Jongens from the Netherlands. 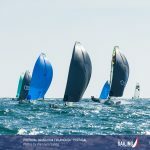 They were leading after day 1 and also scored 6 top 10 races, but scored too many points between days 2 and 3 to remain in overall contention. 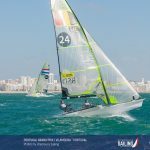 The fleets continue racing with the World Cup beginning on January 29th, 2019.